A wood coffee table in oval shape can beautifully soften the look of your living room while providing adequate space to hold your drinks, snacks, magazines or decorative items. Robust wood construction renders unsurpassable strength with maximum endurance to the coffee tables hence making them long-lasting. These oval wood coffee tables are sure to enhance the elegance of your living room décor with their clean cuts and exquisite designs. From unfinished surface to glossy finish, this oval wood coffee table collection has a wide variety to offer. 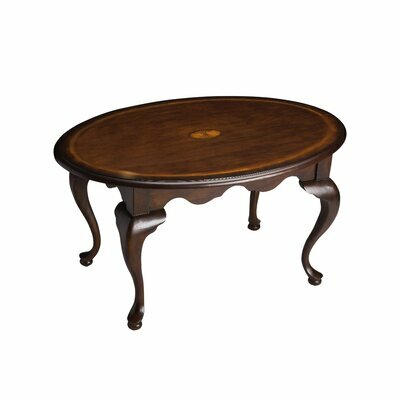 Bedeck your living room with the elegant Apple Valley Coffee Table. This compact size table is ideal for the space-constrained room. But do not underestimate its functionality due to its small size. It comes with a drawer and a bottom shelf that provides additional storage space along with the spacious table top. 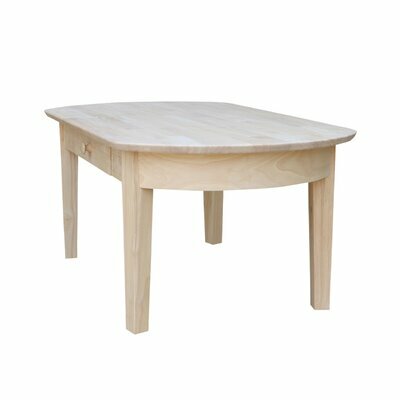 This oval shaped coffee table has rounded edges that render it safe for toddlers and little kids getting bumped into it. It is manufactured from solid ash and oak veneers for unsurpassable strength and durability. 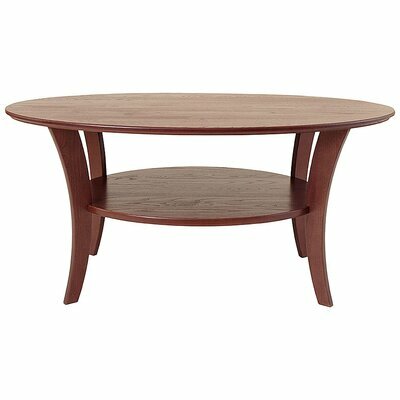 It features medium oak finish and an oval shape; this attractive coffee table is indeed a delight to the eyes. Add a style statement to your home with the handsome look of Calloway Coffee Table. 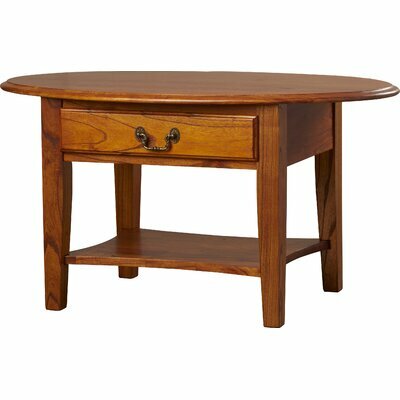 It is an elegant piece of furniture featuring an oval shape and sturdy hardwood solids and veneers construction. This contemporary style coffee table has an extensive and spacious bottom shelf where you can keep your books, magazines, game accessories or CD collection for easy access. Pair the coffee table with your sofa set and create a picture-perfect living room. Featuring rich, creamy finish and dramatic pie-crust molding on the table top, the Hicks Coffee Table showcases a hard-to-miss profile. The lovely Queen Anne legs add further charm to its overall look. 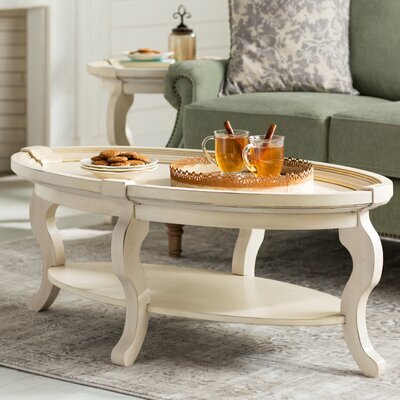 From shabby elegance to formal room style, this elegant coffee table is thoughtfully designed to be the piece de résistance to any room décor. The gorgeous look of Revere Coffee Table with a striking combination of brown cherry top and black base is sure to take your breath away. It has an oval shape that beautifully suits most of the room décors. 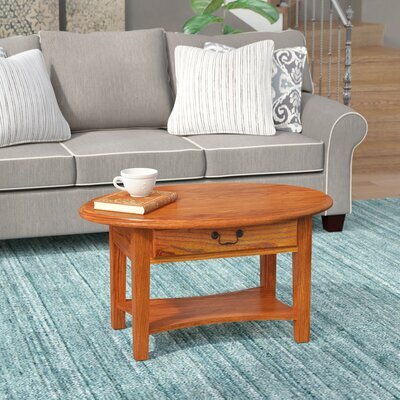 This charming coffee table is built out of solid wood that renders maximum durability and permanency. A roomy drawer with antique finished classic style drawer pull further adorns the look of this lovely coffee table. The drawer along with spacious table top and a bottom shelf provides ample space with high utility value. Keep your newspapers and magazines on the shelf and other valuable items in the drawer for a neat and organized living room. Trendy and chic, the Mererid Coffee Table is a must-have in every home! It features a gorgeous cutout design and an oval shape that add character to any living room décor. The rounded edges make it safe for the home with toddlers and little kids. Multiple shelving compartments provide enough space for keeping your stuff organized and displaying your favorite decorative items and collectibles. 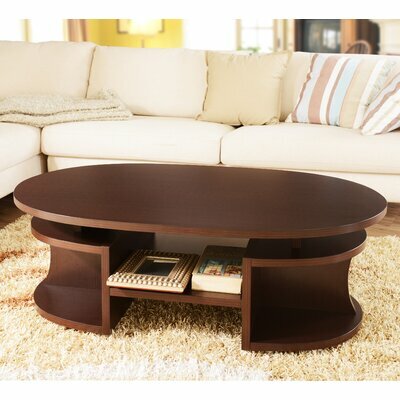 Create a warm and welcome living room setting with the graceful Alaterre Simplicity Coffee Table. It features solid hardwood construction in natural wood finish with warm tones of brown, tan and grey. This elegant coffee table has an oval shape and Queen Anne style legs that complement a wide array of living room settings. Intensify the ambiance of your living room décor with this enchanting beauty from Emestina Coffee Table collection. It features solid wood and manufactured wood construction with linen-fold inlay design on walnut and maple veneer table top. Its oval shape, distressed look, Queen Anne legs and marvelous design on top make it a classy piece of furniture that everyone admires and wishes to have in their home. Bring home the graceful yet straightforward Unfinished Wood Philips Coffee Table to create an ambience of old world charm in your living room. Unfinished surface and immaculate cuts give this coffee table countryside feel. Featuring an oval shaped top, it occupies very little floor space. Broad table top and a small drawer increase its utility value allowing you to load it with multiple items at once. Solid parawood construction makes this coffee table sturdy and durable to witness countless coffee-time gossips with your family. 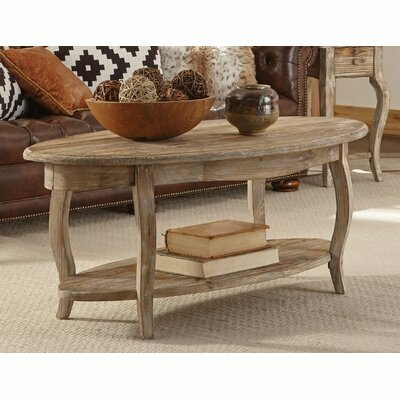 Featuring incredible rustic style, the Rochdale Bretton Coffee Table is sure to win you compliments of your guests. The oval-shaped table features stone top with the wooden frame while the base is made from antique bronze finished wrought iron. The Tuscan sun finish on top looks marvelous and adds character to its overall look. Ornate metal legs give a classy touch while adding depth to the design of this gorgeous coffee table. A fixed metal shelf at the bottom is great for displaying decorative items or keeping your books and magazines. Add style quotient to your living room with the timeless look of Manchester Wood Coffee Table. 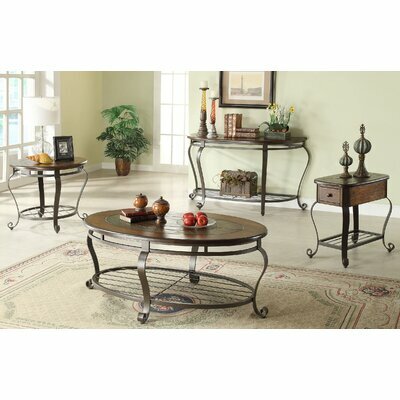 The oval shaped table top with the bottom display shelf and curved legs give this coffee table a chic look. The top is broad and wide with enough space for holding snacks and drinks along with a flower vase or other decorative items. The sturdy and curved tapered legs are wobble free to provide unshakable support to the table. 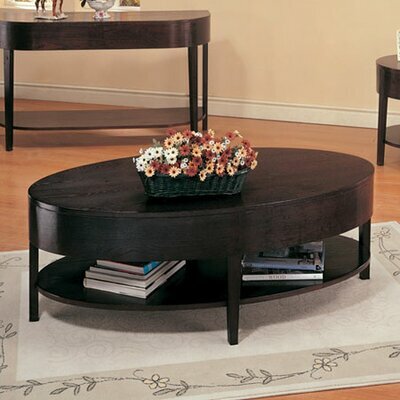 Sure to last long, this coffee table features solid ash wood construction and stain resistant lacquer finish. Made from eco-friendly materials, it is non-toxic and hence safe for your family and pets. With maximum 150 pounds of holding capacity, the Manchester Wood Coffee Table is easy-to-maintain and quick to assemble.